To be atheist, as opposed to agnostic, is to find predictability and comfort in the belief that the prime constituent of the universe is matter. In this view, consciousness is an emergent phenomenon that arises from matter that has accidentally been organized sufficiently. Belief in a materialist universe offers an illusion of metaphysical certainty. There's comfort in believing that our current scientific understanding is substantially complete, and substantially correct. That all that's left to work out are kinks and details. The belief suggests what is to be valued, and provides purpose: science, knowledge, technology, experimentation. The atheist points to the many successes of this process as evidence that brightness lies this way. The water-efficiency of dinosaur foods! 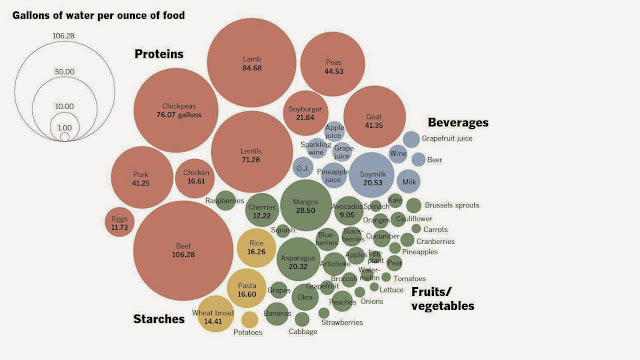 I'm happy to find out that dinosaur foods - eggs and chicken - are actually by far the most water-efficient sources of protein! Way more calorie-water-efficient than mangos and asparagus, too! Yay! Before I started escorting, I often just didn’t eat on my days off (I worked in a kitchen and was allowed to eat whatever I wanted at work, so that was helpful). I often didn’t have $2.50 to ride the bus. I don’t mean I just didn’t have any cash on hand, I literally didn’t possess two dollars and fifty cents, nothing in the bank or anything. One time my bike got a flat tire and I didn’t have the $4 to buy a new tube and I didn’t have $2.50 to take the bus to work even just one way so I had to walk the 12 miles round trip to work and back for a couple days until I got paid.This is an adult woman; gainfully employed, in a minimum wage job; without children; without apparent alcohol troubles, or drug habits. After doing lovely work like scrubbing toilets all day, 90% of her income would go for rent and taxes. I beg your indulgence for being a bit tongue-in-cheek. Far be it from me to suggest that the US is the only, or the most, insane country in the world. That's probably Saudi Arabia. Or lately, ISIS, if anyone recognized them as a country. But the US insanity is peculiar. It is so markedly different, in a hard-to-nail-down way, from insanities we see elsewhere. The question is the nature and cause of this insanity. And of course, I wouldn't be writing if I wasn't itching with a theory. For most people in the world, who consider Americans to be generally crazy, the stories in TV and movies happen in a clearly different, far-away land. For people in the US, though, those stories happen at home. There's no distance.